Surikov can be judged by the following episode: when he finished the painting “Boyary Morozov”, one of his friends, the artist, visited him. Looking at the huge canvas stretched on the wall, he pointed to Surikov at a strip of snow below and advised to remove it, because in the plot of the picture she did not play a role, only made it more cumbersome. “What are you,” Surikov answered him. – How can I remove it. After all, then the sleigh will not go. “Miraculous Image” – Surikov’s appeal to religious themes. Once the king of Mesopotamia was seriously ill, so that no one could cure him. 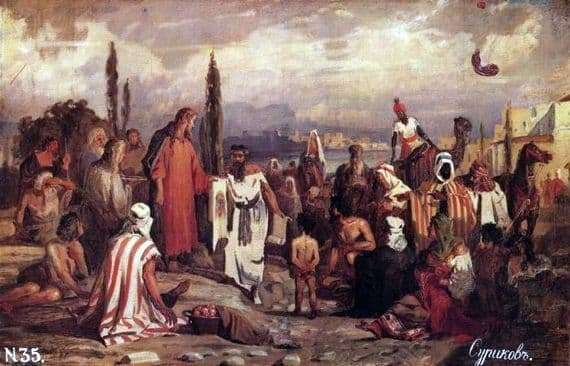 Hearing rumors that a man is wandering around Judea, healing the sick, after meeting with whom the saints begin to see and walk without legs, he sent an ambassador to Christ to beg him to come to Mesopotamia. But Christ refused – instead, he took the ambassador cards, washed and wiped his face, after which his image remained on the cloth. The picture depicts exactly this moment – Christ stretches the white-handed image to the ambassador in white clothes. His pose speaks of mercy and that such action is habitual to him. He sees nothing unusual in him. But people around are looking surprised, confused, the ambassador’s face speaks of fear and hope at the same time – he was going after the prophet, and he brought a rag, but not simple, but wonderful… Above the stage is a sky full of clouds, grayish and faded from heat. The camel and the horse do not understand the revival reigning among the people and stand quietly. One old man closes his eyes, as if unable to endure the bright light pouring into them.